After driving constantly one winter day and stopping in at Eagle Plains along the Dempster Highway for dinner, we headed off again through the rolling hilly countryside of the northern Yukon Territory. It was like a winter wonderland, then the sun began to set. We pulled into a pullout along the road, set up the tripod and camera and took this interesting shot. 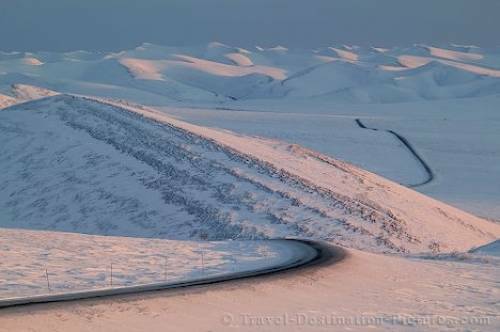 The road disappears behind a snow covered hill then reappears on the other side as it winds its way towards another range of rolling hills. Dempster Highway, Yukon Territory, Winter, Canada.